Posted on 09/30/2016 by Lesli W.
Part III: In which we learn about the limitations of one American’s driver education, find the correct trail, reach the summit, lose the trail, use technology to find it again, begin the descent and get rescued by the Germans. In the process, we observe how small we really are in the grand scheme of things! Il giorno seguente and all legs are really sore from our rambling, brambling adventure. Thus, day 2 was dedicated to kayaking. The Golfo di Orosei is dotted with coves, caverns and exquisite beaches, the likes of which I’ve never seen in my life. Excited to see the coast from the water, we drive up to Cala Gonone in search of kayaking adventure. It’s also my birthday, so that the day began with pressies from abroad didn’t hurt my mood one bit. Kayaks procured, we’re in the water after an early lunch (seafood salad, octopus, bruschetta – the real stuff – a girl could get used to this Mediterranean food!). We kayak down the coast, ducking into the time- and water-swept rock formations that make up this amazing coastline. One beach (Cala Fuili) is virtually empty… only accessible by water, and I am sure this is where they take those surreal photos you see in travel magazines. Each time we maneuver around a curve in the coastline, the view is more breathtaking than the last. Our final point of interest is Grotte del Bue Marino, a giant cave set into the shoreline. We only scratch the surface here, as the walkways into the grotto were closed. It’s at about this point that C’s eyes begin to react badly to the combination of glaring sun and salty Mediterranean Sea, so we turn back, indulge in a gelato (we’ve earned it for having done a 10km kayak and having a birthday to celebrate) and head home. I interject here that, although three people have attempted to teach me over the years, I have still not mastered the art of driving a standard. We’re in Italy, on a mountainous island with steep, windy, hairpin-turn roads. C’s eyes do not improve. As life and luck would have it, my stick shift skills have not either. So our options unfold as a) camp out on the side of the road in our rental car, b) borrow a driver from a passing vehicle going our way or c) slog it out. One or two attempts in borrowing a driver result in some really strange looks, careful retreat by some tourists and a possible blow jobbus interruptus (which is Swedish and/or Latin for “we almost stopped a ‘parked’ car to ask for a ride” then decided we best not). Staying put does not suit either of us. The elephant is blamed again. So we begin the slog (I interject again here again to praise not only the driving skills of my partner in crime but his tenacity and a sense of something akin to humour, even under duress); slow and steady winning the day, with the prize coming in the form of a limoncello nightcap on the most fabulously memorable birthday in recent history (grazie ancora, mio caro amico). 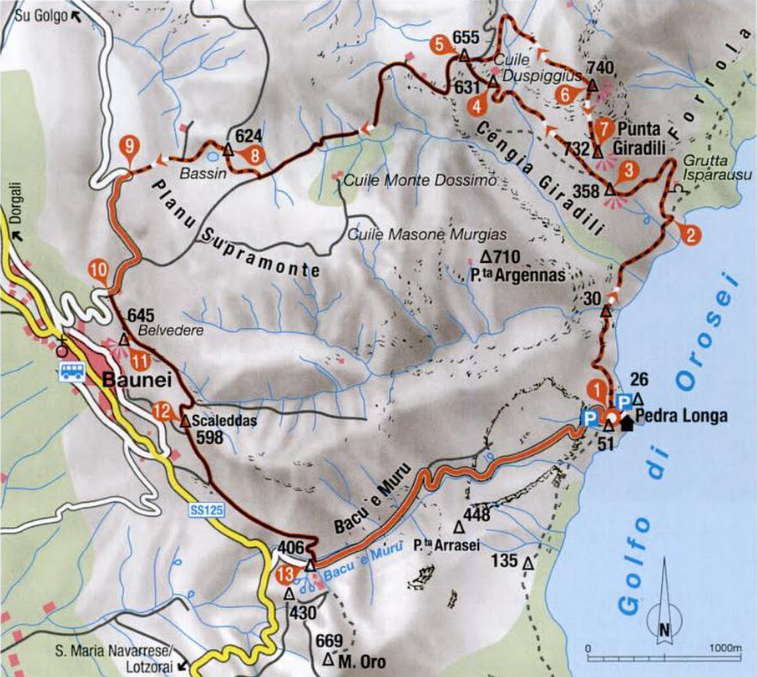 Day 3 of avventura: we decide to find the summit, and so we start out from Pedra Longa towards Punta Giradili. When you’re walking these trails, there is a faint resonance of goat bells and bleating in the air. Sound carries in the quiet sky; goat chatter bouncing off volcanic rock, mingling with the clonking of their bells to make a sort-of sporadic background music suggestive of wind chimes. Today, we’ve consulted two guide books and an actual expert (Riki, from The Lemon House), who had shown us the ridge we were supposed to be on last time. And so, avoiding the bramble experience of the other day, we stick to the trail and as we ascend – this time on the right track – we are awestruck at the landscape (and the views) that unfold around us. This is some of the most magical terrain either of us has ever hiked. Akin to looking into a star-laden night sky or staring into the deep blue sea at 25 meters, the sheer scale of the cliffs we’re ascending gives perspective on one’s place in the Universe. Just WOW. This is where we’re supposed to go! I’m in this picture… can you find me? By now, we’ve made the summit, exchanged high-fives and started for the exit, as it were. But in our eagerness to explore the razor-sharp moonscape that is Punta Giradili, we’ve lost the trail again in the flat light against the lava rock. Time spent backtracking to where we should have been: 1 hour. Cheers for Garmin to lead us in the right direction: 3. There’s a rock-ridden fire road that wends its way down from the summit to the back side of the mountain and into the towns below. We trek onward and downward, and 2 or 3km on (feet screaming, sun blazing), we agree that this is not much fun. Seeing as the car is back at Pedra Longa, a 5-9km slog from where we are (depending on whose sign/directions you dare consult), a ride would be good at this point. We’ve already gone about 17km, so we decide to hitchhike. I’m hopeful when (within minutes) a tourist bus passes, slows and finally stops (there must have been a vote in those seconds, “do we pick up these sweaty strangers or non?”). As we board, the first question is, “sprechen sie Deutsch?” I’m grateful for other countries’ language requirements (and that I have a multilingual companion), the answer is “ja.” Less optimistic when they ask “where are you from?” and C says, I’m from Sweden (nods and smiles all around); L’s from the US (a collective groan issues forth). Chatter continues, however, and they drop us at a point “3km” (more like 4.5) from the car. The finish line is at last in sight as Pedra Longa comes into view. Today we earn Adventure Points for a 21+ km hike, a found trail, hitchhiking, and being rescued from a desolate road by a busload of German tourists. C earns bonus points for using Garmin to get us back on-trail and speaking near-flawless Deutsch (somehow even bringing in Ewoks into the conversation). Grilled squid and gelato rule the evening as we plan giorno quattro. This entry was posted in Europe, Travel and tagged cala fuili, cala gonone, Europe, golfo di orosei, grotte del bue marino, hiking, italy, kayaking, life lessons, pedra longa, photography, punta giradili, sardegna, sardinia, selvaggio blu, squid, Travel by Lesli W.. Bookmark the permalink.